﻿﻿ As we continue our education about forklifts, the types and available features, we explore the second of three types tires and probably the most common tire know as, the Pneumatic tire. As the term implies, pneumatic tires were originally designed with an air inner tube. 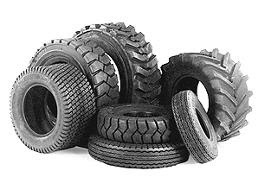 Forklift manufacturers have incorporated these tires into their product designs to deal with specific environmental challenges that this equipment may endure. These tires are used on lift trucks that need to be able to leave the smooth and well paved foundations of the warehouse and go outside onto uneven or possibly undeveloped ground. Please keep in mind that the tires are not interchangeable on the forklift so you need make sure the lift you buy is correct for use in your the environment. As time and technology have progress, tire manufactures have developed two additional styles with similar functionality Developed in an effort to provide a lift that is smooth riding but resistant to puncture, tire dealers have developed a process to fill these tires with foam. This is accomplished by taking the regular tubeless or tube type tire and pumping it full with liquid polyurethane material. The material goes into the valve stem on the older style pumps and through the sidewalls on the newer pumps. The foam fill is a two-part material consisting of an A-side and B-side. When the two sides are pumped into the tire, the material mixes and cures out for 24-48 hours depending on the outdoor temperature. The curing process can be sped up in the wintertime by preheating the fill and keeping the tires warm after being pumped. Air is released during the filling process by drilling a hole through the top of the tire. Once all of the air has escaped, the tire will be plugged and then pressurized. Finally, the third style is referred to as a Solid Pneumatic. In the design of this tire, the manufacturer has basically eliminated the cavity for the inner tube and made the tire solid rubber. Made of solid rubber, the tire has no hollow portion and is totally made of solid rubber. Some manufacturers make them in 2 layers while some make them in three layer rubber compounds. The tire consist of the outer layer, a medium core and softer core to get the smooth cushion feel while having the confidence of a flat free condition. The solid rubber design does have one drawback and that is that the ride on the forklift is now much harder than it was with the air pneumatics. The solid pneumatic tire has proven to be one of the most significant innovations in the forklift tire industry. Subscribe to this blog to keep yourself informed about forklifts and the forklift industry.